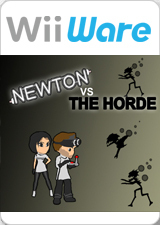 Use physics to splat those nasty creatures before they get close in Newton vs. The Horde. Squash them, skewer them, explode them and do whatever you can to help our scientist friends survive. Complete almost thirty levels across 4 zones and then try and beat the special challenge in each. The graph below charts the compatibility with Newton vs. The Horde since Dolphin's 2.0 release, listing revisions only where a compatibility change occurred. This page was last edited on 22 January 2018, at 01:56.